Hanover Engineering was retained by Denver Borough to design and prepare the plans and contract documents for the expansion of recreational facilities in the Memorial Park Annex, located in Denver Borough, Lancaster County. The project consisted of the development of youth athletic fields to meet the expanding community needs, and complement other full-size athletic fields in the park. The project was funded, in part, through a grant from the Pennsylvania Department of Conservation and Natural Resources, Bureau of Recreation and Conservation (DCNR). Hanover Engineering prepared the project drawings and specifications for the construction of the multi-purpose youth athletic field designed to accommodate soccer, baseball, and football field configurations. Other site improvements completed as part of the project included the expansion of the pedestrian pathway system and installation of stormwater facilities. The paved pathway was carefully designed to connect to and enhance the existing pathway system. Stormwater management and drainage design considerations included the use of subsurface drainage tile for the athletic field and subsurface infiltration for the paved pathway. In addition, all site improvements were designed to protect the surrounding wetlands, and extensive screening was included to minimize the impact on adjacent residences. 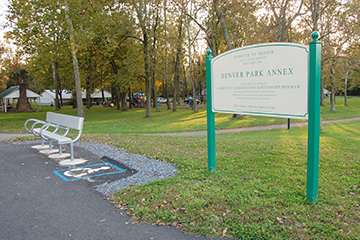 Hanover Engineering assisted Denver Borough in complying with all DCNR grant requirements, and provided construction administration and observation during the course of the project.